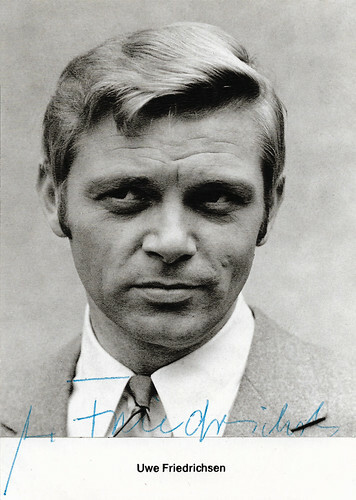 German film, stage and television actor Uwe Friedrichsen (1934-2016) was best known for his roles in several popular TV series. He was also known as the German voice of Peter Falk’s Columbo. German postcard by Franz Josef Rüdel, Filmpostkartenverlag, Hamburg. Photo: Constantin / Rialto. Publicity still for Der Gorilla von Soho/The Gorilla of Soho (Alfred Vohrer, 1968). German postcard by Franz Josef Rüdel, Filmpostkartenverlag, Hamburg, no. F-73. Photo: Jürgen Fritsch. Pobably a publicity still for the TV series Elephant Boy (Bill Bain a.o., 1973). The little monkey is probably a toque macaque. Uwe Friedrichsen was born in 1934 in Altona (now Hamburg), Germany. He was the son of an engineer. After graduation, he completed a commercial apprenticeship at a Hamburg porcelain company. In the amateur playgroup of the Hamburg Volkshochschule he discovered acting. Against the will of his parents he started a private acting school, which he financed as a harbour worker and newspaper boy. In 1953 he founded the theatre 53 together with Marcus Scholz and others. After three years at this theatre, actress and stage director Ida Ehre spotted him in 1956 and engaged him for the Deutsche Schauspielhaus in Hamburg under Gustaf Gründgens. Until 1968, he was one of the ensemble members, while he was a guest at many other theatres. In 1957, he started his film career with two small roles as a student. He made his debut in the West-German comedy Lemkes sel. Witwe/Lemke's Widow (Helmut Weiss, 1957) starring Grethe Weiser. It was a remake of the silent comedy Lemkes sel. Witwe/Lemke's Widow (Carl Boese, 1928) with Lissi Arna. He played another student in the Austrian comedy Die unentschuldigte Stunde/The Unexcused Hour (Willi Forst, Rolf Kutschera, 1957) with Adrian Hoven and Erika Remberg. He also had a small part in the West German musical comedy Die Nacht vor der Premiere/The Night Before the Premiere (Georg Jacoby, 1959) starring Marika Rökk and Theo Lingen. 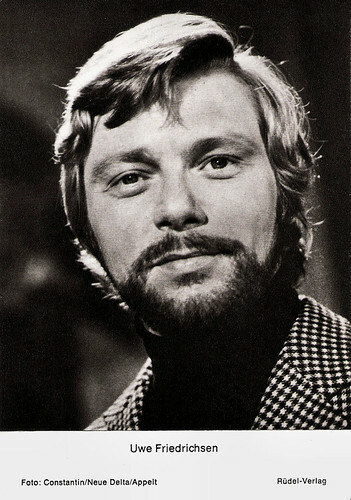 Although in his mid-twenties, Friedrichsen appeared as a pupil in the West-German film Faust (Peter Gorski, 1960), based on Goethe's Faust and adapted from the theatre production at the Deutsches Schauspielhaus. The film starred director Gorski's adoptive father Gustaf Gründgens as Mephistopheles and Will Quadflieg as Faust. Jan Onderwater at IMDb: “In 1957 Gustaf Gründgens staged a new production of Goethe's Faust in which he once again played Mephisto, a part he had played since 1932. The brilliant production was a huge success and ran for a couple of years. In 1959 Peter Gorski captured the performance on film in his directorial film debut. 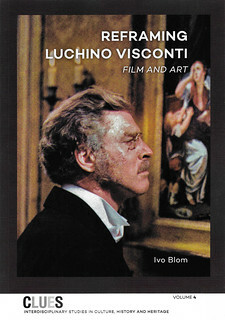 Basically it is a registration of the production, but Gorski did manage to accentuate the details of the acting by using enough medium and close-up shots which give a view on the acting you normally would not able to see in a theater.” The film won a Deutscher Filmpreis (German Film Award). Another supporting role followed for Friedrichsen in the West German adventure film Unser Haus in Kamerun/Our House in Cameroon (Alfred Vohrer, 1961), with Johanna von Koczian and Götz George. He played a leading role opposite Maria Perschy in Der Chef wünscht keine Zeugen/No Survivors, Please (Hans Albin, Peter Berneis, 1964), a rare example of a West-German Science Fiction film! Aliens attempt to take over the Earth by taking over the bodies of humans at the moment of their death, and using them as tools for their invasion plans. 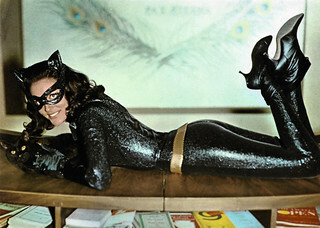 However, the film was a commercial flop. In the early 1960s, the German film industry imploded and like many of his colleagues, Friedrichsen focused on working for TV. 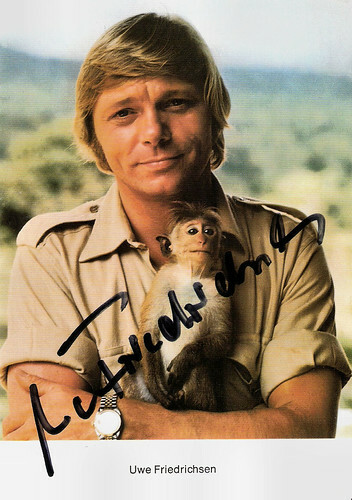 He had a hit with the detective series John Klings Abenteuer/John Kling (Hans-Georg Thiemt, 1965-1970) in which he played the side-kick of the title figure (Helmut Lange), who played a detective working for an American secret service. John Kling was originally a pulp fiction hero, whose novels were very popular in Germany from 1924 till 1939 and from 1949 till 1954. In the meanwhile Friedrichsen also appeared as Sergeant Jim Pepper in the West German crime film Der Gorilla von Soho/The Gorilla of Soho (Alfred Vohrer, 1968) opposite Horst Tappert and Uschi Glas. It was part of Rialto Film's long-running series of Edgar Wallace adaptations, and was shot on location around London and at the CCC Studios in Berlin. German postcard by Franz Josef Rüdel, Filmpostkartenverlag, Hamburg. Photo: Constantin / Neue Delta / Appelt. Publicity still for Einer spinnt immer/One is always nutty (Franz Antel, 1971). 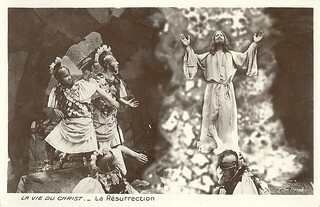 German postcard by Franz Josef Rüdel, Filmpostkartenverlag, Hamburg. Photo: Hans-Peter Bartling, Hamburg. Uwe Friedrichsen co-starred in the Austrian/West German comedy Einer spinnt immer/One is always nutty (Franz Antel, 1971) with Georg Thomalla and Teri Tordai. He also appeared opposite Horst Tappert in the naughty comedy Bleib sauber, Liebling/The Love Keys (Rolf Thiele, 1971), but Friedrichsen found more interesting work on television. He played opposite Esrom (Esram Jayasinghe) as the elephant boy Toomai in the British-Australian-German youth series Elephant Boy (Bill Bain a.o., 1973), based on a story from Jungle Book by Rudyard Kipling. For the series the location was not India but Ceylon and the story was moved from the 19th century to the present. He also appeared with Horst Frank and Jürgen Prochnow in the TV film Operation Ganymed (Rainer Erler, 1977). A spaceship returns to Earth after several years of space exploration and finds it desolate. Landing in what they believe is Mexico, the crew decides to travel north, and try to find out what happened to Earth during the years they were gone. The film won an award at a Science Fiction Festival in Triëst and was so popular that it was also released in the cinema in 1980. Among little children he became known as Uwe in the German version of the children’s series Sesame Street, Sesamstraße (1979–1982), in which he appeared together with Liselotte Pulver and Horst Janson. He then starred as customs officer Hans Zaluskowski in 18 episodes of the Krimi series Schwarz Rot Gold/Black Red Gold (1982-1996). Through the years, he guest starred in all of Germanys favourite Krimi series, including Der Alte (1985-1996), Tatort (1986) and Derrick (1989, 1996). He also played mayor Hinrich Oppen in the TV series Oppen and Ehrlich alongside Andreas Schmidt-Schaller. The series showed the lives of two dissimilar half-brothers, mayor Hinrich Oppen and manufacturer Ottwin Ehrlich, and was situated in Sauerland in the early 1990s. In the cinema Uwe Friedrichsen could be seen in a small part in the German comedy Die wilden Fünfziger/The Roaring Fifties (Peter Zadek, 1983), starring Juraj Kukura and Boy Gobert. The film, based on the novel Hurra, wir leben noch by Johannes Mario Simmel, is set around the German Wirtschaftswunder economic miracle of the 1950s, with the title alluding to the Roaring Twenties. He also appeared in the comedy Go Trabi Go 2 – Das war der wilde Osten (Wolfgang Büld, Reinhard Klooss, 1992), a bland sequel to the hit Go Trabi Go (Peter Timm, 1991). His final film was the youth film Das Haus der Krokodile/Victor and the Secret of Crocodile Mansion (Cyrill Boss, Philipp Stennert, 2012), which won the Bavarian Film Award. 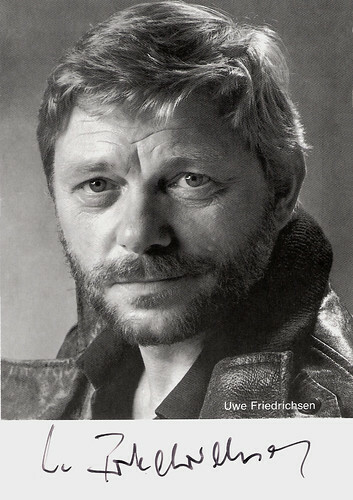 Friedrichsen was a popular voice actor who gave a German voice to amongst others Ringo Starr in Yellow submarine (George Dunning, 1968), Donald Sutherland in MASH (Robert Altman, 1970), Danny Clover in Lethal Weapon films (1987-1998) and to Peter Falk in the TV series Columbo (1969). He also worked for many radio plays. However, the main focus of his professional activity remained the stage. For several years he had a permanent place in the ensemble of the Ernst-Deutsch-Theater in Hamburg. In the 2005/2006 season, he played in the Theater im Rathaus Essen. In addition, Uwe Friedrichsen was a great advocate of the Low German language, which he learned as a small boy with his grandparents. Uwe Friedrichsen died in 2016 in Hamburg, at the age of 81. In 1988 he married the Swiss actress Nathalie Emery, with whom he had a daughter. They divorced in 1995 and in 2002 he married Ute Papst. With his second wife, he later lived in Seevetal near Hamburg. He had three children from earlier relationships. Friedrichsen died of the consequences of a tumour on the cheek and at his request, he was given a burial in the Baltic Sea. DVD Trailer John Klings Abenteuer (1965-1970). Source: POLAR Film (YouTube). Scene from Operation Ganymed (1977). Source: Rapidherzfeld (YouTube). Sorry, no subtitles! Sources: Jan Onderwater (IMDb), Wikipedia (German and English), and IMDb.